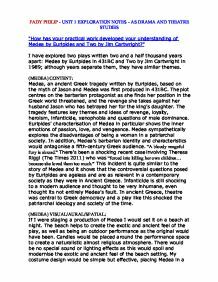 How has your practical work developed your understanding of Medea by Euripides and Two by Jim Cartwright? 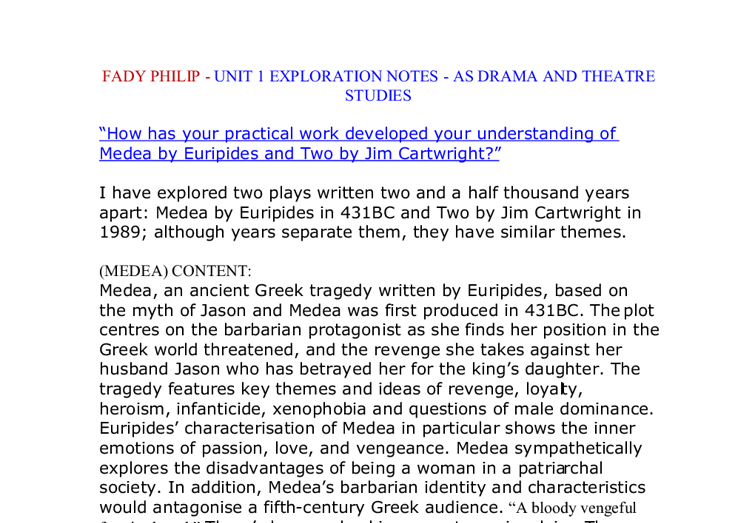 FADY PHILIP - UNIT 1 EXPLORATION NOTES - AS DRAMA AND THEATRE STUDIES "How has your practical work developed your understanding of Medea by Euripides and Two by Jim Cartwright?" I have explored two plays written two and a half thousand years apart: Medea by Euripides in 431BC and Two by Jim Cartwright in 1989; although years separate them, they have similar themes. (MEDEA) CONTENT: Medea, an ancient Greek tragedy written by Euripides, based on the myth of Jason and Medea was first produced in 431BC. The plot centres on the barbarian protagonist as she finds her position in the Greek world threatened, and the revenge she takes against her husband Jason who has betrayed her for the king's daughter. The tragedy features key themes and ideas of revenge, loyalty, heroism, infanticide, xenophobia and questions of male dominance. Euripides' characterisation of Medea in particular shows the inner emotions of passion, love, and vengeance. Medea sympathetically explores the disadvantages of being a woman in a patriarchal society. In addition, Medea's barbarian identity and characteristics would antagonise a fifth-century Greek audience. "A bloody vengeful fury is abroad." There's been a shocking recent case involving Theresa Riggi (The Times 2011) who was "forced into killing her own children... because she loved them too much." This incident is quite similar to the story of Medea and it shows that the controversial questions posed by Euripides are ageless and are as relevant in a contemporary society as they were in Ancient Greece. Infanticide is still shocking to a modern audience and thought to be very inhumane, even thought its not entirely Medea's fault. ...read more. Man the pumps, pull out the stops, raise the prices, come on let's polish them off. You take the spirits, I'll take the beers." In my research of the northern-southern 1980s divide, I found out that there were big differences between the two regions. The North had been getting poorer and poorer during the 1980s, especially due to the closure of mines by Prime Minister Margaret Thatcher to reduce costs. This caused much unemployment and poverty in the North. However, the South was becoming richer and more prosperous under Prime Minister Margaret Thatcher. This is shown in the play by how the characters have failed aspirations and are just sitting around, being bored. For example, Fred and Alison are fat, bored and unprivileged, but at least they have each other's intimacy. Another example would be how Roy shows anger at a random young man in the pub for wearing jeans. In addition, there is a very noticeable variation in accent and dialect between the North and South. (TWO) VISUAL/AURAL/SPATIAL: If I were staging a production of Two, it would be set in a classic English pub, which would be the main focus for the audience. Brown would be the key colour, because it represents beer, Guinness, ale, wood, furniture and most traditional English pubs. I would use amber gel, in a wash lighting state to create a warm atmosphere. There would be a profile spot light, so that it can pick out where you want to audience to look at. For example, in the scene of the old man, the profile spot light would focus just on him. I would also use haze to create a 'smoking feel' to the pub, since most people smoked in pubs during the 80's before it was banned. ...read more. I used a seductively slow pace of vocal delivery to help attract female attention and attraction. It also showed his confidence and relaxed nature. (TWO) INTERPRETATION: In my performance of the character Moth, I wore a black leather jacket with sleeves rolled up, which is a sign of coolness and confidence. I also wore dark blue jeans to show that I'm young and in touch with modern fashion. I also wore a pair of black gloves to show that I'm self-aware and trying to look unique compared to all the other people in the pub. Before my final performance of Moth and Maudie with Mina Hambro (my partner), we worked on some improvisations and rehearsal methods involving both sub-text and off-text. In one workshop, Mina and I had to improvise the scene before Moth and Maudie went to the pub. We decided to place the scene in Maudie's flat. Maudie is very keen on Moth to sleep over at her flat, but Moth persuades Maudie that they should go to the pub instead to "meet people." The conversation between them in the improvisation is very similar to the actual pub scene in the way that Maudie thinks she has more control over the relationship, but Moth is the one subtly controlling it with his persuasive and seductive techniques that Maudie easily falls for. Also, the fact that it is in Maudie's flat shows that Maudie is employed and can be independent, while Moth is unemployed and financially dependant on Maudie. The only thing keeping Maudie attached to Moth is her love and affection for him. This was our interpretation of their relationship. (MEDEA+TWO CONCLUSION) Although both plays are different, both have elements of social criticism that opened my perceptions of how society functions and the social problems within it. ...read more. 3)Another convention that they used was how, when the actors went inside the set (the last scene) where they were hidden from the 'voyeurs', a CCTV camera inside projected images on to the actual set could still see what they were doing. The last thing that topped off Natella Abashvili's cruel and vicious character was the violent hissing that repeated over and over again. If Natella Abashvili got upset or angry with someone Ruth Connell would fiercely turn at them and hiss at them, screwing up her mouth and cheeks intensely as if she was a snake. For example, she convinces Kreon to allow her to stay in Corinth one more day, only to reveal her contempt for him to the Chorus, calling him a "fool", after he has left. This creates tension in the dialogue, and is contrasted with lyrical, poetic language used by the chorus. We looked at the section of the play where Medea pretends to reconcile herself with Jason. By substituting 'blah' for all the words, we first saw the ratio of one character's speech to another's: Medea said the most by far, dominating the scene. Language is also used to show change in characters, for example at the beginning Wisehammer is rough and has no hope for the future "alone, frightened, nameless in this sinking hole of hell", however as the play progresses we actually see him as being one of the more educated convicts. Another effective vocal skill used by Stuart Goodwin was the Irish accent that he used to differentiate the Father from the other characters on stage.